Happy new year! 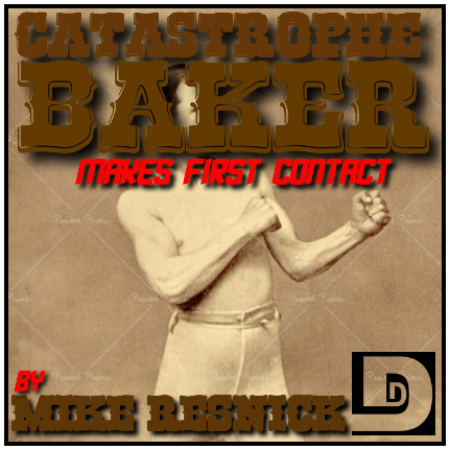 Everybody’s favorite galaxy-hopping (as well as bed-hopping) hero, Catastrophe Baker, is back in another Mike Resnickian adventure. Has he met his match when making first contact with an alien race? AND NOW FOR A BLATANT PRODUCER PLUG! Need a voice for your e-learning, presentation, video, commercial, voicemail system, book narration, insert random pro voicework here, anything that needs a voice?! Just ask Tobias at TEQ Studios for a quote today! Special thanks to Tobias Queen for producing today’s episode; to Kathryn Pride, and Renee Chambliss for lending their voices to the tale. This entry was posted on January 1, 2012 at 12:49 pm and is filed under Comedy, Mike Resnick, Science Fiction, Short Story, Western. You can follow any responses to this entry through the RSS 2.0 feed. You can skip to the end and leave a response. Pinging is currently not allowed. Fun as always, I could hear the grin sneak though in some of the lines. But that was a good thing. As far as motivation… My web site I have to post everyday. I don’t always do it, but it’s my goal to do it everyday. There’s a special stubbornness that goes with that, it’s something I want to do. As far as staying motivated on the website, knowing that the only way to make it into what i want is to keep on going, well that’s the carrot and the stick. Just keep going, when you look back, “holy crap I’ve been doing this for months!” Seeing the progress and hoping for the future. Now after putting my son to bed, all I want to do is zone out, but I have to do dishes (no dishwasher), clean up dinner and pick up all the kids crap. I have to give myself bait to get motivated to do that. Usually it’s looking forward to reading a book with a cup of tea, or just poking around on the web for a bit once I’m done. Having that to think about gets the dishes done. Become stubborn with yourself, i think it’s the way to success; whether it’s a project, daily chores, attaining a goal, or losing weight. You have to hold yourself to a standard, it has to sting when you fail and be sweet when you succeed, you are the only one who will hold yourself to it. I need a q-tip to get all the sappy music out my ears now though…. cheers guys! Anyway, back when I was still trying to be the best at everything, I had a saying. “If you aim for the sun, you’ll likely hit the moon.” If you make it your goal never to miss a point, you won’t actually get 100%. Not every time. But you’ll probably still get a high grade. You have to pych yourself up to aim for the sun, but you can’t beat yourself up when you actually hit the moon. Because hitting the moon is pretty darn good, and it was the real goal all along. We play mind games with ourselves to help us accomplish big projects (…like making an A in Physics). Four stories are probably more than you would have written last year without the goal of 25. Pat yourself on the back, Big! That’s awesome! I don’t think I wrote 4 short stories last year. Rish, you have a podcast that hundreds of people listen to every week ,and hundreds (thousands?) of authors send you work hoping you’ll like it. In addition, because of the way Creative Commons works, I bet some of your shows keep popping up on the internet for decades, probably after you’re dead. That’s a huge accomplishment! So you don’t have a movie on Lifetime; so what? Who watches Lifetime anyway? As always I loved the episode. The fact that it was another Catastrophe Baker story only made it all the better. I really do like these productions and I would love to hear all of them done by you all. Keep up the good work! Thank you! I love the Catastrophe Baker adventures. More please! BTW, I heard the girl say “Solar sail” despite her accent. But then I’m from a southern continent too.